Home / Nature Therapy / What is Nature Therapy? The following is adapted and condensed in part from this published interview. Nature therapy (and nature-based therapy) are buzzwords that you might have heard being thrown around more and more these days. This cutting-edge field has remained out of the mainstream so far because people haven’t figured out what it means or how it applies to them. But that’s all about to change. We already know that many clinicians like myself have expanded their prescription pad to include diet (e.g., culinary medicine) and exercise (especially exercise outside) alongside more traditional medical interventions like pharmaceuticals. I firmly believe that within a generation, more and more doctors will add nature therapy to that shortlist as we recognize it as a vital lifestyle intervention with immense health benefits, both immediate and long-term. I’ve long been passionate about health and culinary medicine, intimately connected to my work as a doctor and chef. So when I told my clinician friends that I was rehabilitating an old nursery and converting it into an urban teaching orchard and farm, they were absolutely thrilled for me. My friends told me about the beauty of roaming their own rose garden, the joy of building their own outdoor pizza oven, or their blissful vacation to the ocean to ski and sail or the mountains to hike and ski. Gradually I realized my friends were going outside in order to feel better, lower their stress, and improve their personal health—and so was I.
I loved the process of process of creating a certified organic farm and participating in regenerative agriculture so much that I decided to return to school, receiving a permaculture design certificate and becoming a certified California naturalist. I learned how to keep bees and dogs, foster fungal ecosystems, manage water, and plant and grow vegetables and fruit-bearing trees. I realized that like my friends, I too was using my time spent on the farm as a preventive and therapeutic tool. 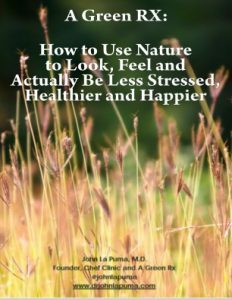 When I learned that being outside improved blood pressure, cortisol, anxiety, mood, and focus—and corporate institutions worldwide were using elements of nature therapy to improve worker creativity and productivity—I knew I’d hit on something special that I needed to bring to medicine and medical practice. So let’s back up: what exactly is this exciting, burgeoning field called nature therapy? 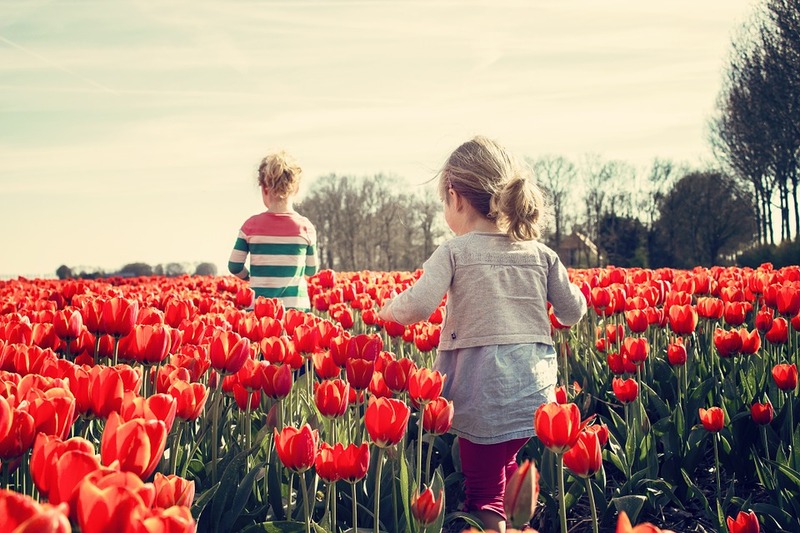 Nature therapy is a new, evidence-based field in medicine defined as the prescriptive, evidence-based use of natural settings and nature-based interventions. Simply put, it’s about using nature to help us heal—and using scientific data to find those green prescriptions. When people think of nature therapy, they might think of it a simple call to “go outside more.” But the truth is there’s so much more to nature therapy than that. There are so many sub-disciplines within nature therapy that show the diverse range within the field: adventure therapy, animal-assisted or pet therapy, blue care, care farms, ecotherapy, forest bathing, green exercise, nature meditation, nutrition (herbal, botanical, floral), therapeutic horticulture, wilderness immersion, and more. Because nature therapy is such a wide umbrella, the existing research in nature therapy and green medicine comes from all over the map, spanning disparate fields such as horticulture, interior design, architecture, forestry, wildlife management, auditory and color science, and herbal and botanical medicine. This interdisciplinary approach brings a huge amount of dimension and variety to the field. It’s also important to note that nature therapy is much more advanced in countries other than the United States; the United Kingdom, Australia, Japan, Korea, and much of northern and central Europe already have traditions in the field, though some of the research from these countries hasn’t been translated yet. It’s clear that in just about every way, nature therapy is much more expansive, varied, and far-reaching than you might have originally perceived it to be. There are innumerable (and scientifically documented!) ways that nature therapy is beneficial for our health. Here’s one salient example: studies have shown that walking in natural settings, like a forest or park, has been linked to improved short-term memory, concentration, cortisol levels, natural killer cell number and activity, heart rate and blood pressure. Exercising in nature—in sight of and preferably near water or greenery—is more effective and therapeutic (not to mention less expensive!) than exercising indoors. A recent Stanford study of nature therapy showed significantly reduced rumination after a 90-minute walk in nature compared to a 90-minute walk through an urban environment. In this same study, those who walked through nature for 30 minutes a day reported a decrease in negative thinking. Magnetic resonance imaging showed that the nature walkers had lower activity in an area of the brain linked to risk for mental illness compared to urban walkers. Rumination, which is little discussed, but often searched for, is commonly seen in people with anxiety and generalized anxiety disorder. So by simply switching your morning run from a treadmill to your local park, you can multiply and diversify the kinds of benefits you’re getting, both physical and mental. There are so many people with a wide variety of medical conditions who would benefit from nature therapy. People with attention-deficit/hyperactivity disorder (ADHD), anxiety, insomnia, hypertension, and myopia have specifically been shown to benefit from time spent outside. The research continues to emerge in this area, showing benefits for physical, emotional, mental, and spiritual well-being. And that’s just the tip of the iceberg: nature therapy has impacted improved postoperative recovery, birth outcomes, and pain control for patients; studies of community gardening have shown reduction in glycosylated hemoglobin in people with diabetes with no intervention other than growing vegetables; and gardeners have been shown to be less likely to develop dementia than non-gardeners. Nature therapy’s mission is to prevent and improve various symptoms, clinical conditions, and general well-being for patients, and the field is dedicated to making these kinds of tools available to every family—regardless of their proximity to blue or green space. One of the most amazing things we’re learning from this research is that there are ways to get the health benefits from nature without actually immersing yourself in it, or exercising in it (although both are really fun!). Whether it’s out of fear or lack of access, some people can’t get to the great outdoors—but bringing the great outdoors to them can have huge impacts. Even just putting up a poster of nature or looking out a window onto nature provides quantifiable health benefits. A pioneering study by psychologist Roger Ulrich studied patients with a view of a window and those without. Among 23 of the matched post-op patients, the ones with a view of nature from their bed had fewer complications, needed less medication, and left the hospital sooner compared to those staring at a brick wall. Another way to get a dose of nature therapy from inside is to cultivate and care for your houseplants. And many of us have built-in animal therapy at home in the form of our beloved pets. So if you water your indoor plants and regularly cuddle with your cat or dog: guess what? You’re already engaging in nature therapy without even knowing it. Another way to enjoy the benefits of nature is through VR. My colleagues and I created a pilot program using virtual reality (VR) nature scenes of the beach, underwater scenes, and sky scenes for children receiving flu shots, about which the Wall Street Journal allowed us to write. Patients in the VR group used a free app (Aquarium VR) for about 30 seconds in total before and during vaccination. The children who used VR reported 48% less pain than controls, and their parents’ perception of their child’s pain was 45% less than that of parents of controls. The health-care staff reported VR children had 74.7% less pain than controls. Basically, what we’re learning is that views of nature are not simply a distraction from pain—they actually engage parasympathetic and biophilic impulses that lessen a patient’s experience of acute and chronic pain conditions. Our recent letter published in the Wall Street Journal illustrating the importance of vaccination also notes our pilot program and how it dovetails with the medical mission of improving disease prevention, minimizing pain and fear in children receiving vaccines. If you’re interested in learning more about this burgeoning field and how you can incorporate it into your lifestyle, you can find so many resources at my website. You can even take a test to find out if you’re suffering from a nature deficit! So many forces are converging to give rise to the field of nature therapy, one of which is the personal, social, environmental, and financial consequences of the disconnection from nature that so many people are feeling these days. Both climate change and its accelerated pace, as well as to our relationship with technology, contribute to this growing disconnection. Climate change affects more than just the climate; it changes our health, too. Extreme weather worsens disease, food insecurity and food quality directly, as well as air, water and shelter quality and adequacy indirectly. Our obsession with personal technology contributes to our disconnection from nature; U.S. adults look at screens for 11 hours daily on average. These days, people stay inside nearly 22 hours a day; so many of us have little familiarity with nature and, even worse, are actually fearful of it and unsure how to adapt to it. I truly believe that nature therapy is poised to become incredibly relevant in the everyday lives of Americans as the century progresses. If we realized that the dual forces of global warming and overwork were separating us from our natural position as part of nature instead of apart from it, I believe we would be less likely to stand by and watch its plunder as it and we are threatened. As extreme weather events become dizzyingly common, as the arctic shelf dwindles irrevocably, as politicians debate and argue over the Green New Deal, the question of how we can live differently for the health of our planet, our communities and ourselves is in the forefront of everyone’s mind. Nature therapy is just one answer to that question, empowering us to take ownership of healing ourselves—and perhaps, in the process, help heal each other.